We describe some simulations that compare cultural transmission between and within generations (inter-generational vs intra-generational transmission) in populations of embodied agents controlled by neural networks. Our results suggest that intra-generational transmission has the role of adding variability to the evolutionary process and that this function seems particularly useful when the population lives in a rapidly changing environment. Adaptation to environmental change is slower if cultural transmission is purely inter-generational while it is faster if a certain amount of intra-generational cultural transmission makes it possible to remove earlier and no longer suitable behaviors, facilitating the emergence of new and more appropriate ones. Whereas genetic transmission is necessarily from parents to offspring, cultural transmission can, in principle, be from any individual to any other individual. An individual can learn behaviors, information, and values from any other individual that the first individual takes as his or her teacher or model. Traditionally, one distinguishes between three types of cultural transmission: vertical, oblique, and horizontal transmission (Cavalli-Sforza and Feldmann 1981; Boyd and Richerson 1985). Vertical transmission takes place from parents to offspring; oblique transmission from individuals of one generation to unrelated individuals of the next generation; horizontal transmission between individuals of the same generation. In principle, an individual might acquire his or her behaviors, information, and values on the basis of any arbitrary proportion of vertical, oblique, and horizontal cultural transmission. In practice, the relative importance of the three types of cultural transmission varies with the type of society and one interesting way of analysing and comparing societies is to determine what is the relative role of the three types of cultural transmission in the cultural upbringing of their members. For example, vertical transmission appears to be especially important, relative to oblique and horizontal transmission, in small-scale, traditional societies (Hewlett and Cavalli-Sforza 1986). On the other hand, horizontal transmission - and in particular, young people learning from other young people rather than from adults - appears to have acquired a greater role in present-day economically advanced societies. In our simulations an agent's behavior is controlled by a neural network, a hugely simplified model of the nervous system. At the beginning of the simulation the connection weights of the agents' neural networks are assigned randomly and therefore the agents are unable to behave effectively. However, the agents that for chance reasons behave even slightly better than other agents are selected as teachers or models for the agents of the next generation. A learner does not copy the behavior of its teacher exactly but the learner introduces some random changes that will make its behavior similar but not identical to the teacher's behavior. The changes that are introduced by learners tend to make their behavior less effective than their teachers' behavior but in some rare cases they lead to behavior that is better than the teachers' behavior. The selective cultural reproduction of the best individuals of each generation and the constant addition of new variability to the pool of culturally transmitted behaviors result in the gradual acquisition, across generations, of behaviors that are effective and appropriate to the world in which the agents live. In our simulations we compare two types of cultural transmission: oblique cultural transmission and horizontal transmission. We describe a basic simulation of oblique cultural transmission in which behaviors are transmitted from the best individuals of each generation to the individuals of the next generation and this leads to the cultural emergence of effective behaviors. We then ask what is the role of horizontal cultural transmission (between young people) and we describe new simulations in which either horizontal transmission is the only form of cultural transmission or cultural transmission is in part oblique and in part horizontal. Our hypothesis is that horizontal transmission is basically a way of introducing random noise in the cultural transmission process. When the environment remains identical from one generation to the next, this random noise may not be necessary, or it may even be harmful if it is too great. However, if the environment changes rapidly, the random noise introduced by horizontal transmission can be useful in that it serves to eliminate old and no more adaptive behaviors and to create the conditions for the emergence of new behaviors more adapted to the changed environment. This analysis might help explain the increase in the relative importance of horizontal cultural transmission in societies that like present-day economically developed societies tend to change at a very rapid pace. In Section 2 we describe the general scenario of the simulations, the characteristics of the agents that are simulated, the way in which cultural transmission is implemented in the model, and all the details of the simulations. In Section 3 we present the simulation results. Finally, in Section 4, we summarize the results and we draw some conclusions. The simulated environment is a bi-dimensional square that contains 50 randomly distributed edible mushrooms that the agents have to eat and 50 poisonous mushrooms that they have to avoid. The behavior of each agent is controlled by a perceptron, i.e. 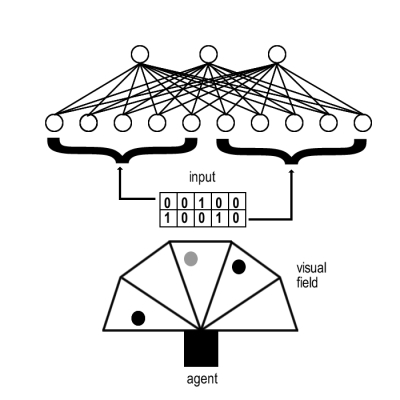 a two-layer neural network, with ten input (sensory) units, three output (motor) units, and no internal units (Figure 1); transfert functions of the units are logistic functions. Sensory input from the mushroom is encoded in the following way (cf. Baldassarre 2001). Edible mushrooms and poisonous mushrooms are of two different colours, let's say A and B. The agents have a one-dimensional 180-degree retina which is receptive to the two colours. The entire visual field is divided into five sectors and what appears in each sector is encoded in two input units. One input unit is activated in correspondence to the presence, within the sector, of an A object and the other input unit is activated in correspondence to a B object, where the A and B objects are the two closest mushrooms in that sector of the visual field (Figure 1). The three output units encode the manner in which the individual moves in the environment: two units determine the direction of movement and the third unit encodes the speed of movement, that is, the distance covered in each cycle by the individual. Each individual agent lives in its own copy of the environment for 10 epochs of 50 input/output cycles each, for a total of 500 cycles, which correspond to 500 movements. At the beginning of each epoch the agent is placed in a randomly selected location of the environment. Its energy increases by one unit for every edible mushroom eaten and it decreases by one unit for every poisonous mushroom eaten. A mushroom is considered as eaten if the agent finds itself closer than a threshold distance from the mushroom. When a mushroom, edible or poisonous, is eaten, the mushroom disappears and a new mushroom, of the same type, appears in a random location in the environment. 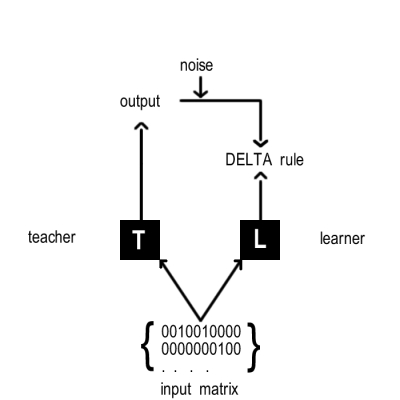 Our model of cultural transmission (Denaro and Parisi 1996, Hutchins and Hazlehurst 1995; see also Parisi 1997) uses a supervised learning algorithm according to which the output generated by a neural network in response to some input is compared with the desired output, called teaching input, and the difference between the two outputs, called error, is used to gradually modify the network's weights, until the outputs generated by the network become sufficiently similar to the desired outputs and the error tends to zero. Applied to cultural transmission, the desired outputs are the outputs generated by another network, the teacher's network, in response to the same inputs presented to the learner. The type of real-life learning that inspires this model of cultural transmission is learning by imitation: the individual who learns observes how the teacher behaves in response to some situation and progressively he or she learns to respond to the particular situation in the same way as the teacher. Even though at the beginning of learning the learner's behavior is different from the teacher's behavior, because the learner's connection weights are randomly assigned at birth, after a certain number of repetitions of the learning procedure the weights are modified in such a way that the learner's behavior looks like the teacher's behavior. Using this procedure, Denaro and Parisi (1996) have shown that in a population of neural networks initially nonexistent behaviors can emerge if two conditions are satisfied: (1) teachers are selected from among the best individuals of the preceding generation, and (2) there is addition of some random noise to the teacher's output so that learner's behavior turns out to be slightly different, randomly, from the teacher's behavior. Both conditions appear to be realistic since in cultural transmission various biases determine the choice of the individuals from which to learn (Boyd and Richerson 1985) and what an individual learns is never exactly a copy of the original behavior. In our model, the best individuals, namely, the individuals which are better at approaching the edible mushrooms and avoiding the poisonous mushrooms, are chosen as teachers, and a certain quantity of statistical noise alters the teacher's output used as teaching input by the learner so that the learner, at the end of the learning, behaves in similar, but not identical, ways with respect to the teacher. This statistical noise is intended to stand for factors such as errors in transmission, intentional modification of behavior, recombination of aspects of the behaviors of different teachers, and so on, which constantly introduce new variants in culturally transmitted behaviors. Cultural learning takes place at the beginning of each epoch in the first 6 of the 10 epochs that make up an individual's life, namely, when the individual is young. 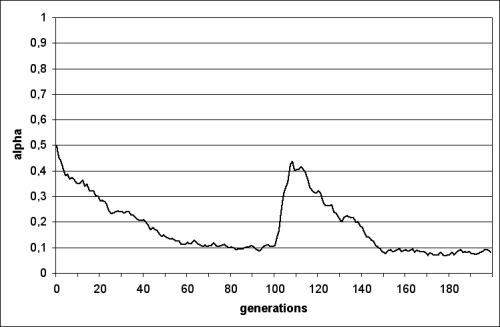 At the beginning of each of these 6 epochs, the individual is assigned a teacher, each time randomly chosen from among the five individuals with the highest energy of the preceding generation, in the case of inter-generational transmission, and from among the five individuals of the individual's own generation which currently have the highest energy, in the case of intra-generational transmission. This implies that, in both cases, normally an individual has more than a single teacher during its life. Two hundred input patterns are presented one at a time to both the teacher and the learner, the two individuals produce an output in response to each input, and the learner's connection weights are adjusted on the basis of the difference between the learner's output and the teacher's output. Each input pattern is a vector of 10 bits (0s and 1s) randomly generated, although, to reflect ecological conditions, the 1s (which represent the presence of a mushroom in a particular visual field sector) are only 0.16 of the total number of bits. (This amount is calculated on the basis of the total number of mushrooms (always 100) and the size of the agents' visual field.) The teacher's output patterns are used as teaching input for the learner but some random noise modifies this teaching input since the value of each of the 3 outputs of the teacher has a probability of 0.05 to be replaced by a random number between 0 and 1. 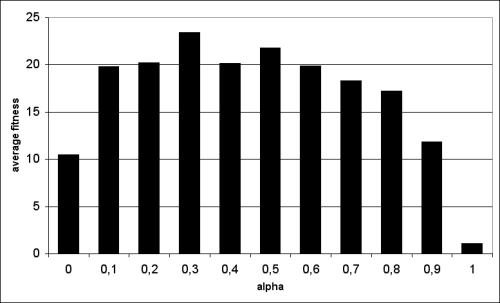 The learning is implemented using the Widrow-Hoff algorithm (DELTA rule) with learning rate of 0.3, where the learning rate defines how much the weight values are modified as a function of error size. This process is repeated at the beginning of each epoch for the first 6 epochs of an agent's life, for a total of 1200 patterns presented. If cultural transmission is purely inter-generational, i.e., all newborn individuals imitate the best individuals of the preceding generation, the behavior of eating the edible mushrooms and avoiding the poisonous ones, which is initially nonexistent in the population, gradually emerges and becomes a stable property of the population (Figure 3). In contrast, if cultural transmission is purely intra-generational, i.e., all newborn individuals imitate the best individuals of their own generation, which are as young and unexperienced as they are, there is no emergence of the appropriate behaviors (Figure 4). In the case of inter-generational transmission, the teachers are adult individuals that have had time to learn from their own teachers how to behave, and since the best individuals of the preceding generation are chosen as teachers, the newborn individuals that represent the new generation have the possibility to learn something useful from their teachers. In contrast, learning purely from peers doesn't seem to have any adaptive advantage in our scenario and does not lead to the evolutionary emergence of useful behaviors. Since all individuals have, at birth, random connection weights, the probability that one of them exhibits some useful behaviour that could be imitated by peers is extremely small. Moreover, with purely intra-generational transmission, the cultural transmission process is not cumulative, i.e. the useful behaviors that, for random reasons, happen to emerge at the end of learning, are not transmitted to the next generation, with the result that each new generation has to start from zero. Given that populations which use only intra-generational cultural transmission are not able to evolve adaptive behaviours, should we conclude that intra-generational cultural transmission cannot play any useful role in cultural transmission? To answer this question we should first ask what might be, in general terms, the consequences of intra-generational transmission. Our hypothesis is that intra-generational transmission has the effect of introducing noise in the cultural transmission process. If an individual learns exclusively from his or her own peers, the peers, having random connection weights, do not have much to teach to the individual and what they tend to transmit is only statistical noise. As we will see, this property of intra-generational cultural transmission, which appears to be a limitation, can be its strength. As we already know, a certain quantity of statistical noise is necessary for the emergence of adaptive behaviors via either genetic or cultural transmission. In our cultural transmission model, a certain quantity of noise is added to the teacher's output (see Figure 2), so that at the end of learning the learner's behavior turns out to be similar but not identical to the teacher's behavior. Since the differences between the two behaviors are random in nature, in most cases the learner will exhibit a less efficient behavior compared to the teacher's behavior but, less frequently, the learner's behavior will be better than the teacher's behavior. The learners that happen to be better than their teachers will tend to be chosen as teachers of the individuals of the next generation, and in this way improvements due to random noise will have a tendency to consolidate and to spread in the population. 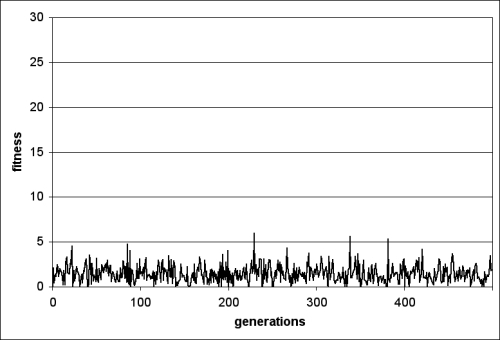 The noise added to the teacher's output functions in cultural transmission as random genetic mutations function in biological transmission: they both make it possible to random search for new and better solutions. To confirm this analysis, if we remove noise from our inter-generational cultural transmission model (Figure 2) and the learner receives as teaching input the unmodified output of the teacher, the result is that the quality of behaviour reaches the level of the best individuals of the first generation but the population can't do better (Figure 5). In fact, it has been observed (Denaro and Parisi 1996) that, if one removes noise from the teaching input, not only the population is unable to go beyond the level of the best individuals of the first generation but the average performance tends progressively to deteriorate because in each generation the behavior is never learned perfectly, as the error, namely the difference between the teacher's and learner's behaviour, never goes to zero. As a result, there is a gradual worsening of the performance generation after generation. In our simulations we not only have replicated Denaro and Parisi's result but we have also demonstrated that this result is influenced by the learning rate applied in the cultural transmission process. 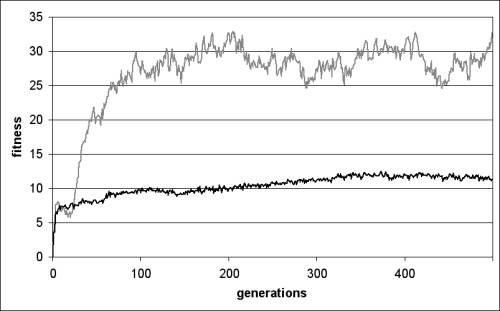 Higer learning rates, in the simulation without noise, can trigger some improvement generation after generation (Figure 6). This effect can be explained by the fact that higher learning rates correspond to higher deviations with respect to the behavior to be imitated, which imply a wider exploration of the space of possible behaviors. This wider exploration, even without noise in the transmission process, can trigger little improvements, although performance remains well below the level reached in the scenario in which noise is present in the cultural transmission process. Now that we have clarified the necessary role of noise in cultural transmission, let us try to understand what might be the function of intra-generational cultural transmission if this type of cultural transmission is interpreted as a noise generation mechanism. Let us imagine that, without noise in cultural transmission, some individuals in each generation learn from their best peers, namely, with intra-generational cultural transmission, while other individuals learn from the best individuals of the preceding generation, namely, with inter-generational transmission. This situation can have two advantages. First, there might be some individuals that already at birth, for random reasons (random connection weights), show behaviors that are more efficient then the behaviors of their peers. With a certain quantity of intra-generational transmission combined with a certain quantity of inter-generational transmission, the possibility that these individuals transmit their behavior to their peers and to the individuals of the next generation is not completely suppressed, as was the case for purely intra-generational transmission. Second, learning from peers that don't exhibit a "correct" behaviour (from the previous-generation standards) can be, as in the case of the learning rate augmentation, a source of noise in the system. What is interesting is that, in this case, noise is "oriented". While in the case of higher learning rates or by increasing the intrinsical noise of the cultural transmission process (the quantity of noise added to the teacher's output) the exploration of the space of possible behaviors takes place in a completely random way, now only the best behaviors, among those not necessarily in line with the previous-generation behaviors, are replicated by the individuals involved in cultural transmission. To test this hypothesis, we created a scenario in which there is no noise in cultural transmission and a variable α specifies the probability that an individual uses intra-generational cultural transmission instead of inter-generational cultural transmission, choosing as a teacher one of the best individuals among its own peers. With low levels of α (0.1) the results are more or less the same as those of the "pure" inter-generational scenario without noise. 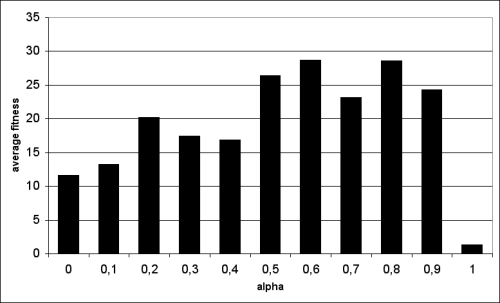 However, with higher values of α, cultural evolution is definitely enhanced (Figure 7). The conclusion that we draw is that, in absence of noise, a certain proportion of intra-generational cultural transmission (in our scenario α = 0.6 is the amount that gives the best results, see Figure 7 and 8) makes it possible to obtain a progressive enhancement of the performance which, in the case of pure inter-generational transmission without noise, is impossible. If α = 1, i.e., if cultural transmission is entirely horizontal, performance is near zero. However, even a very small amount of obliqual transmission (α = 0.9) is sufficient to produce a sufficiently high level of performance in the last 100 generations due to the cumulative process triggered by inter-generational transmission. Until now, our simulation scenario has been a static environment, that is, an environment that doesn't change over evolutionary time. In this environment the problem is to distinguish between edible and poisonous mushrooms, approaching and eating the former and avoiding the latter, and this problem remains always the same during the entire simulation. But in human societies the environment, or the problems encountered in the environment, can change. And, if the environment or the problems encountered in the environment do change, the behaviors developed in a certain environment for solving certain problems may not be any longer appropriate in the new environment and for the new problems. As will be shown by the simulations that we are going to describe, it is in this situation, namely, in dynamic environments that change rapidly, that the limits of inter-generational cultural transmission and, conversely, the positive role of intra-generational cultural transmission, emerge with clarity. Intuitively, in human societies intra-generational transmission tends to be more often used when environmental change is faster. If technological artefacts change at a speed greater than that of generational replacement, it doesn't make much sense to learn to use the old artefacts from the previous generation, but it is necessary to learn from one's own peers to use the new ones. These intuitions seem to be confirmed by empirical research. For example, in a recent study (Knafo and Schwartz 2001) social psychologists compared the importance of intra-generational vs. inter-generational transmission in Israel, respectively among locals and among immigrants from former USSR states. Immigrants' children are statistically less disposed to accept their parents' values as compared to native Israelis' children. The authors explain this result with the rapid changes in the cultural environment that the immigrants have to face. Among the immigrants, parents' behaviors, which might have been effective in a different environment, lose their effectiveness in the new situation. To test this hypothesis we developed a scenario in which there is noise in cultural transmission, and therefore, from this point of view, inter-generational transmission is sufficient and intra-generational transmission is not necessary, but the environment abruptly changes during the course of the simulation after the population has had time to adapt to the preceding environment. At the beginning of the simulation the situation is the same as that of our previous simulations: the individuals have to distinguish between edible mushrooms and poisonous mushrooms, eating the former and avoiding the latter. The situation remains unchanged for 100 generations, during which the individuals develop, via cultural transmission, the appropriate behaviors. At generation 101, however, there is a sudden shift in the environment. The mushrooms that were edible become poisonous and those that were poisonous become edible. It is clear that in the new environment the behaviors which were appropriate in the old environment are no longer appropriate. It is necessary to evolve new behaviors, different from the previous ones, and the population has other 100 generations at its disposal (from generation 101 to 200) to evolve these new behaviors. The simulation compares two conditions. In one condition cultural transmission continues to be purely inter-generational, as in the first 100 generations. In the other condition, when the environment changes, some individuals learn from their peers. The variable α specifies the probability that an individual will choose as its teachers the best individuals among its own peers, instead of choosing them among the best individuals of the preceding generation. 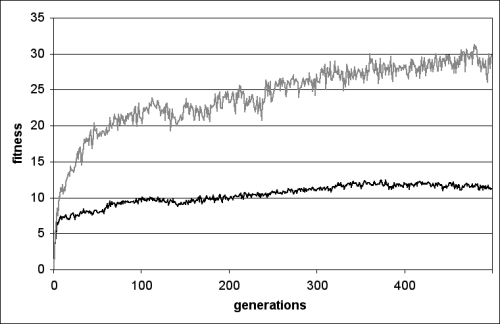 The results show that pure inter-generational transmission (α = 0) only very slowly makes it possible to adapt to such a rapid change in the environment. When the environment changes at generation 101, the performance of all individuals, in both conditions, inevitably crashes down, as they learn from the preceding generation behaviours which are no longer appropriate in the new environment. Then the new behaviours, appropriate to the new environment, gradually emerge, but if cultural transmission remains purely inter-generational, it is a slow process. On the other hand, if at the time in which the change occurs in the environment cultural transmission also changes, shifting from a purely inter-generational transmission, as it was before, to a transmission in which a certain proportion of intra-generational transmission is present, the emergence of the new behaviours that are appropriate to the new environment is significantly faster (Figure 9 and Figure 10). The difference between the two conditions can be explained along the same lines described in section 3.2: the possibility to exploit and transmit the rare behavioral improvements that are due to fact that, at birth, the agents' connection weights are set randomly, and the wider - and oriented - search in the space of possible behaviors. The wider and oriented search in the space of possible behaviors due to horizontal transmission makes it easier to replace the old, inappropriate, behaviors with the new, more appropriate ones. In the preceding simulations, to test our hypothesis we manipulate directly the values of α, the variable that specifies the probability that an individual uses intra-generational cultural transmission as an alternative to inter-generational transmission. 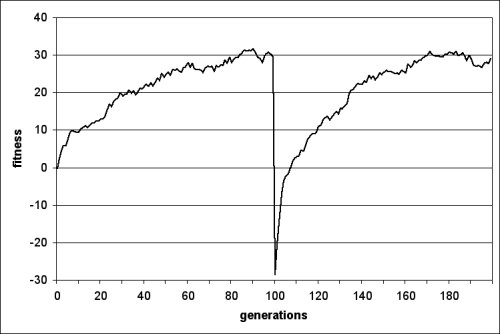 In this last simulation the value of α is controlled by a 'gene' and it evolves using a genetic algorithm. The scenario is like that of simulation 3.3 (dynamic environment) with the only exception that now each individual has a gene with a value ranging from 0 to 1 that determines his probability that the individual will choose as a teacher for cultural transmission one of the five best individuals of its own generation (intra-generational transmission). At the beginning of the simulation gene values are assigned randomly to the 100 individuals of the initial population but in each generation the 20 best individuals of the population transmit their gene value to 5 offspring each, with a probability of 0.01 that this value is randomly re-assigned (genetic mutation). As in the preceding simulations, the ability to eat the edible mushrooms and to avoid the poisonous ones is culturally transmitted and it evolves entirely due to cultural transmission. In other words, the connections weights of the neural network controlling an individual's behavior are not passed from parents to offspring. Drawing on the previous results we expect that for the first one hundred generations, when the environment remains unchanged, the average value of the gene will tend to zero, that is, the individuals will be genetically predisposed to learn from adults, not from peers, but when the environment quickly changes, the value of the gene will quickly rise since the best individuals will be, on average, those who tend to imitate more frequently their peers. That is, in fact, what happens. 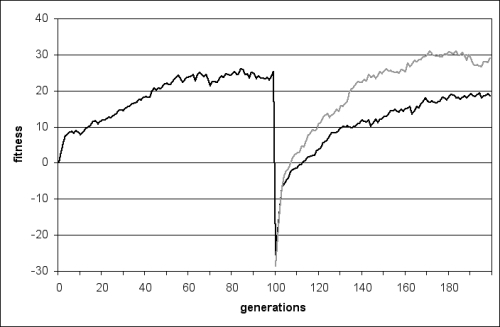 Figures 11 and 12 show, respectively, the average value of the gene that controls the probability that an individual uses intra-generational cultural transmission instead of inter-generational cultural transmission and the average fitness of the population. 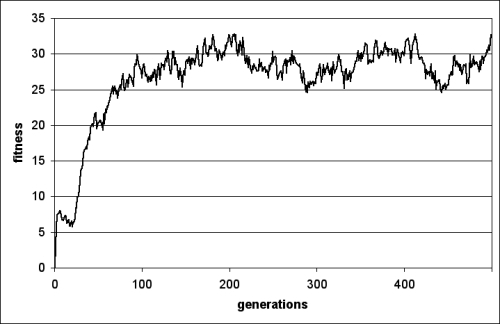 Furthermore, as in the preceding simulation, the performance of the population is decidedly better with respect to the scenario in which only inter-generational transmission is allowed (figure 13). We have used a genetic algorithm to evolve the appropriate vale of the 'gene' that determines the probability of learning from peers rather than from adults. Of course, the genetic algorithm is not to be interpreted literally (among other things, biological evolution is much slower than cultural evolution) but it has been used only to show that this probability itself is adaptive and can be learned. Despite the very simple scenario (the environment of an agent contains, in addition to conspecifics, only edible and poisonous mushrooms, and there are only two behaviors to learn: approaching and eating the edible mushrooms and avoiding the poisonous ones) and the choice of ignoring the possible role of nonsocial (e.g., reinforcement) learning, our simulations provide some suggestions concerning the importance of intra-generational cultural transmission in cultural evolution. Any kind of evolutionary process needs two mechanisms to operate: a mechanism of selective reproduction and a mechanism that constantly adds new variability. In this paper the role of intra-generational cultural transmission has been interpreted as a mechanism that adds new variability. We have shown that, if cultural transmission is inherently accompanied by noise, in such a way that the learner becomes always a variant with respect to the teacher, similar but non identical to the teacher, cultural evolution can take place even if cultural transmission is purely inter-generational and all newborn individuals learn only from the best individuals of the preceding generation. If, however, cultural transmission is not accompanied by noise, with purely inter-generational transmission evolutionary progress stops at the level of the best individuals of the first generation and it cannot go beyond this level. In these circumstances a certain amount of intra-generational transmission, namely, a certain number of individuals that learn from their peers, turns out to be helpful. Intra-generational transmission functions as a mechanism for adding noise to the evolutionary process because peers are "imperfect" teachers, as they have not yet completed their own learning or they are also learning from their peers. It is for this reason that intra-generational transmission adds the noise which is necessary for evolution to take place. It makes it possible to discover new behaviors that may turn out to be more efficient than already existing behaviors. Although, as we have suggested, noise which is added when one is learning from one's peers implies a more directed search than noise which is added when one is learning from any type of teachers, it would be interesting to compare quantitatively the two types of noise. This analysis is confirmed by the simulations in which the environment suddenly changes during the simulation, making the behaviors developed in the previous environment useless and requiring the evolution of new behaviors, more suitable to the new environment. It is in environments that change often and rapidly that the adaptive value of intra-generational cultural transmission emerges clearly. It is for this reason that we have introduced abrupt environmental change in our simulations but, of course, it would be interesting to observe what would happen if environmental change is more gradual. Our prediction is that the positive role of intra-generational transmission becomes progressively greater as the rate of change increases. If the environment remains always the same or if it changes very slowly, cultural transmission has its own mechanisms for adding noise to the evolutionary process (which in our simulations are represented by the random noise that modifies the teacher's output which is imitated by the learner) and inter-generational transmission can be effective and adequate, with no need for intra-generational cultural transmission. If, however, the environment tends to change more rapidly, what is necessary is, first of all, to eliminate the behaviors developed in the preceding environment. It is to solve this problem that intra-generational cultural transmission appears to be useful, and, in some respects, essential. Learning from one's peers rather than from the members of the preceding generation "cleans the slate" by eliminating the preceding behaviors and creates the conditions for exploring the space of possible behaviors and for the emergence of the new behaviors appropriate to the changed environment. In present-day economically advanced societies intra-generational cultural transmission appears to have acquired a greater importance among young people with respect to inter-generational transmission, and is pushed forward by "anti-adultist" values (Schor 2004) and by the action of media and marketing. This may go to the point that adult individuals may exhibit a tendency to learn from young individuals. However, the results of our simulations can be of some comfort for parents, teachers, and adults generally, who can discover that the tendency of young people to learn from their own peers rather than from adults may have an adaptive value in a rapidly changing environment. However, our simulations also seem to show that, in rapidly changing environments, the component of intra-generational transmission and the component of inter-generational transmission have to be properly dosed. 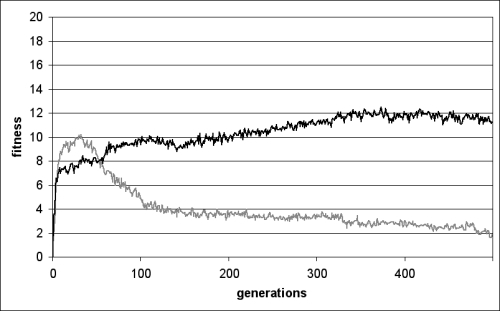 If cultural transmission becomes purely intra-generational (α = 1), our simulations show that there is no evolution. With no learning from the preceding generation, there is no manner to preserve any suitable behavior which has emerged in the past. If, on the contrary, the component of intra-generational transmission is completely absent, and the individuals continue to learn exclusively from the previous generation, adaptation to new environments is slow. The solution seems to be an appropriate proportion of intra-generational and inter-generational transmission, with more intra-generational transmission as the changes in the environment become more rapid. Intra-generational transmission makes it possible to remove existing but no more suitable behaviors, facilitating the emergence of new and appropriate ones. Inter-generational transmission ensures that what has been found and is still useful is maintained and that the evolutionary process is cumulative. BALDASSARRE, G. (2001) Cultural evolution of 'guiding criteria' and behaviour in a population of neural-network agents. Journal of Memetics 4. BELEW, R.K. (1990) Evolution, learning, and culture: computational metaphors for adaptive search. Complex Systems 4(1): 11-49. BORENSTEIN, E. AND RUPPIN, E. (2003) Enhancing autonomous agents evolution with learning by imitation. AISB Journal 1(4). BOYD, R. AND RICHERSON P. J. (1985) Culture and the Evolutionary Process. Chicago: Chicago University Press. CANGELOSI, A. AND PARISI, D. (1998) The emergence of a 'language' in an evolving population of neural networks. Connection Science, 10, 83-97. CANGELOSI, A., GRECO, A. & HARNAD, S. (2000). From robotic toil to symbolic theft: Grounding transfer from entry-level to higher-level categories. Connection Science, 12(2), 143-162. CAVALLI-SFORZA, L. L. AND FELDMAN M. (1981) Cultural Transmission and Evolution: a Quantitative Approach, Princeton: Princeton University Press. CHATTOE, E. (1998) Just how (un)realistic are evolutionary algorithms as representations of social processes? Journal of Artificial Societies and Social Simulation 1(3), http://jasss.soc.surrey.ac.uk/1/3/2.html. DENARO, D. AND PARISI, D. (1996) "Cultural evolution in a population of neural networks". in Neural nets. Wirn-96. Edited by M. Marinaro, R. Tagliaferri. pp. 100 - 111. New York: Springer. HUTCHINS, E. AND HAZLEHURST, B. (1995) "How to invent a lexicon: the development of shared symbols in interaction". in Artificial Societies: The computer simulation of social life. Edited by G. N. Gilbert and R. Conte. pp. 157-189. London: UCL Press. HEWLETT, B. S. AND CAVALLI-SFORZA , L. L. (1986) Cultural transmission among Aka pygmies. American Anthropologist 88(4): 922 - 933. KNAFO, A. AND SCHWARTZ, S. H. (2001) Value Socialization in Families of Israeli-Born and Soviet-Born Adolescents in Israel. Journal of Cross-Cultural Psychology 32(2): 213 - 228. MCQUESTEN, P. AND MIIKKULAINEN, R. (1997) Culling and teaching in neuro-evolution. Proceedings 7th Conference on Genetic Algorithms. San Francisco, Cal., Morgan Kaufmann. SCHOR, J. B. (2004) Born to Buy: The Commercialized Child and the New Consumer Culture. New York: Scribner. PARISI, D. (1997) Cultural evolution in neural networks. IEEE Expert 12: 9 - 11.